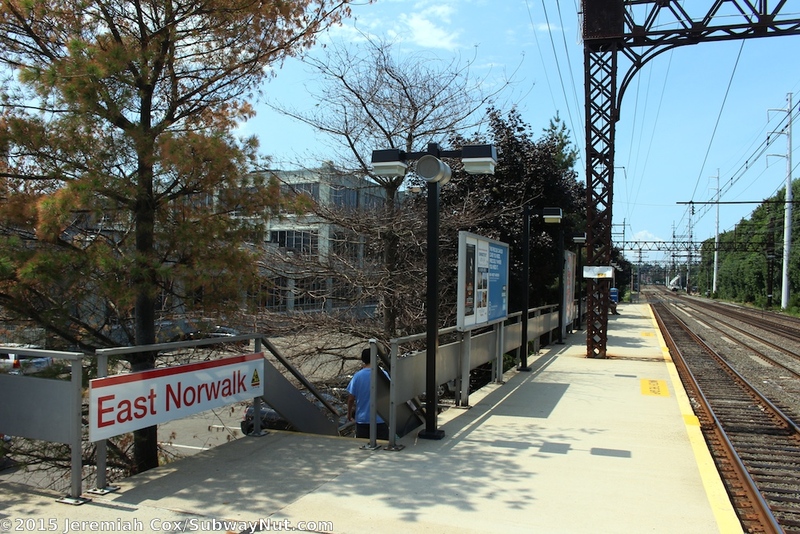 East Norwalk is a poorly designed local stop on the New Haven Line. 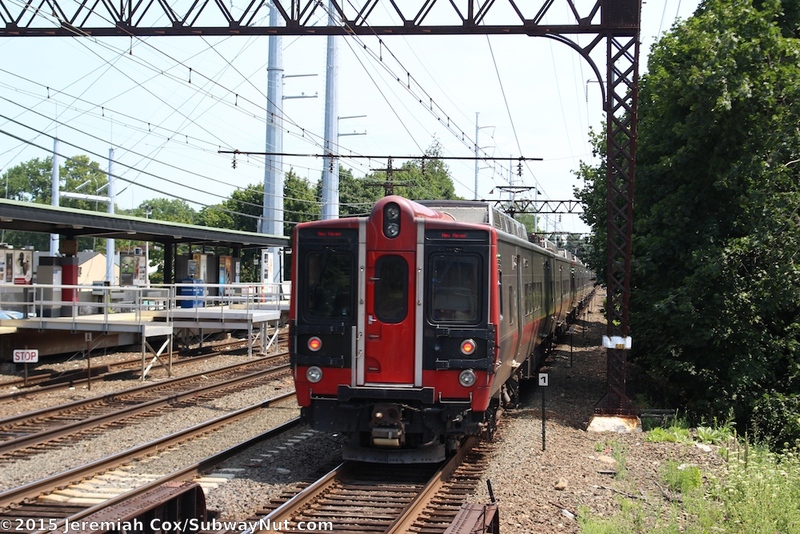 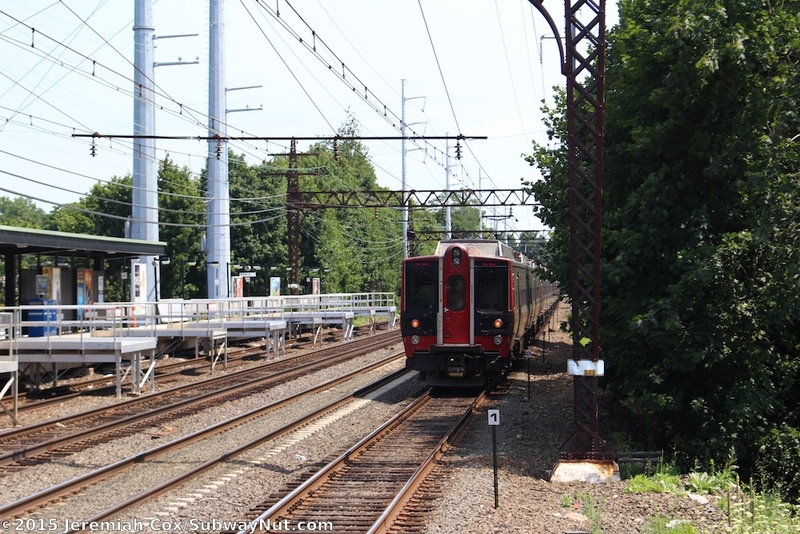 Service is just hourly in off-peak hours (the extra semi-express trains skip the station) with South Norwalk, just a mile east across the Norwalk River receiving more service and major parking improvements with a garage built in 1996. 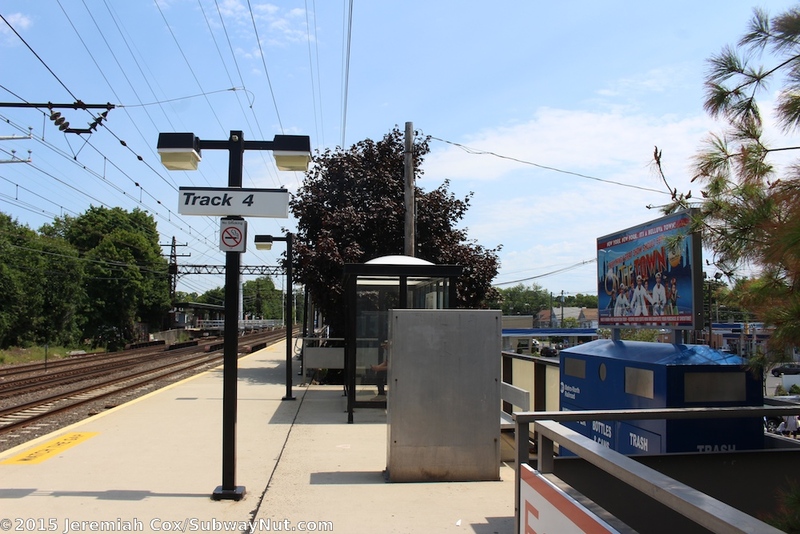 The stop is poorly designed because it consists of two 4 car long, completely offset side platforms that are on opposite sides of the underpass of East Avenue. 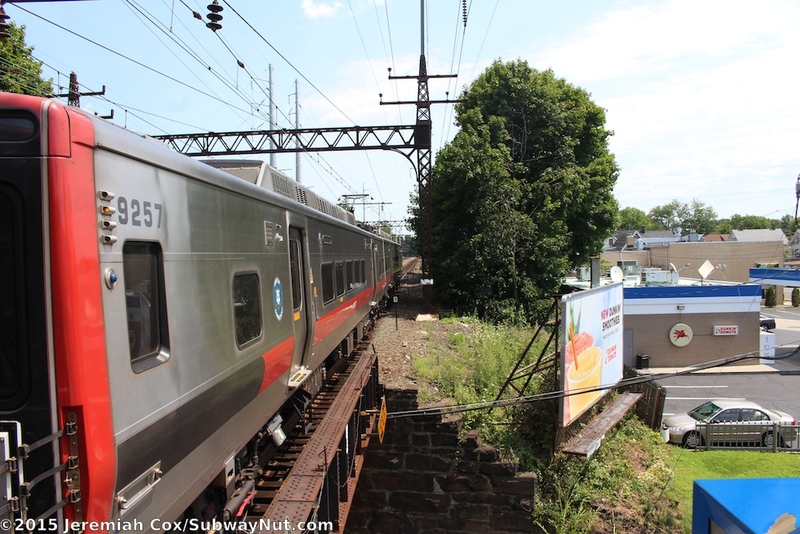 The New York-bound side is to the east, New Haven-bound side to the west, the stops are at the near side of the 'intersection' in bus lingo. 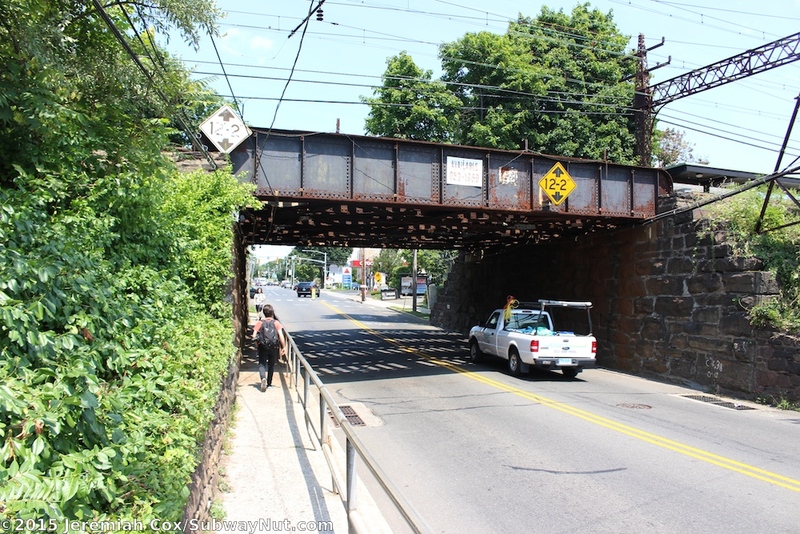 East Avenue is a narrow street with a sidewalk (that has a fence) on only the western side of the street that leads to a poorly placed pedestrian crosswalk on the opposite, north side of the driveway up to the New York-bound platform. 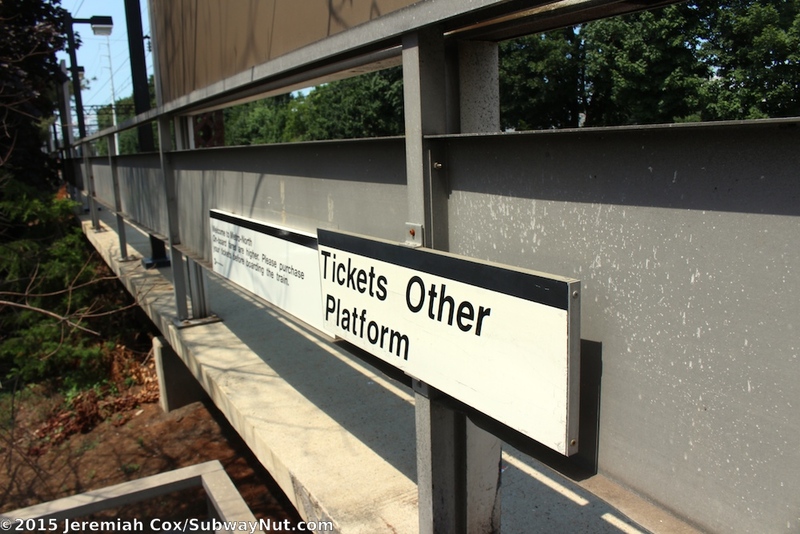 A final design flaw, as intra-Connecticut travel on the New Haven Line continues to increase is the fact that the station's two TVMs are only on the New York-bound side with the New Haven-bound passengers requiring an unnecessary long walk to buy tickets. 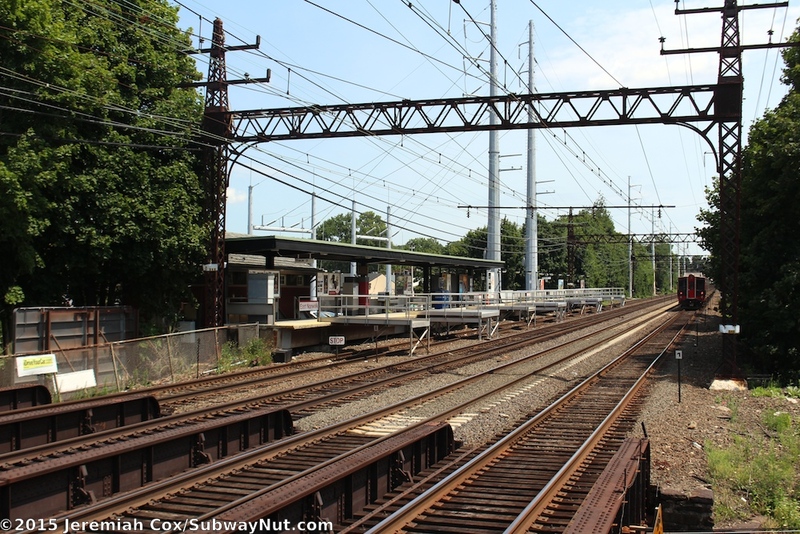 The 4 car long New York-bound platform is canopied for the western third of its length. 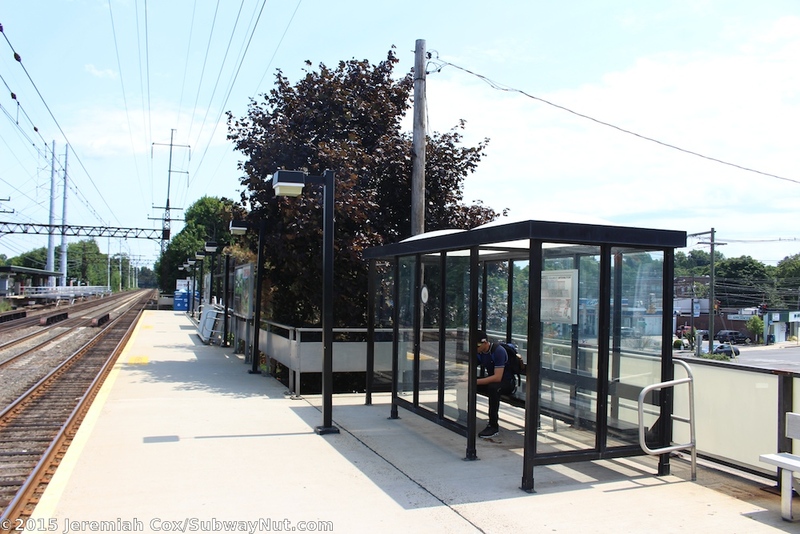 This canopy has a section of windscreens with panels colored blue and brown. 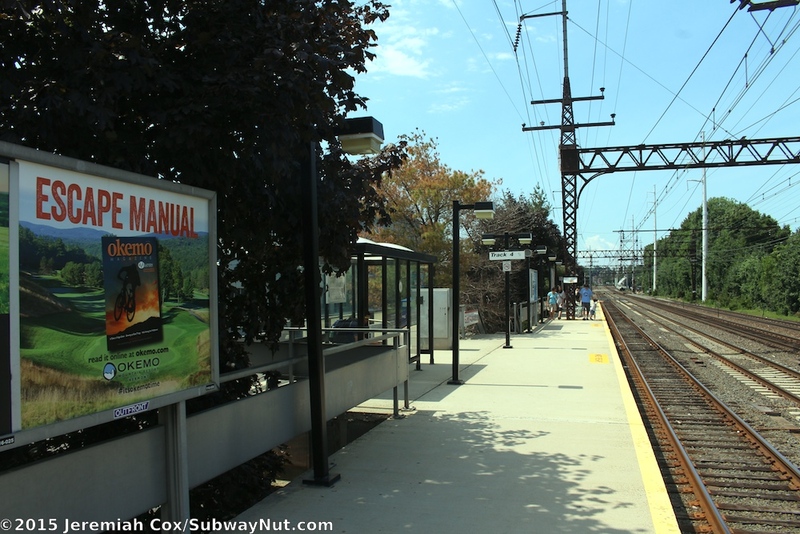 An ADA ramp at the extreme eastern end of the platform and a few staircases lead down to the small roughly 40 space parking lot along the platform At the western end of the platform is the station's small red with a gabled roof station house that looks modern, inside is a small waiting area and shop. 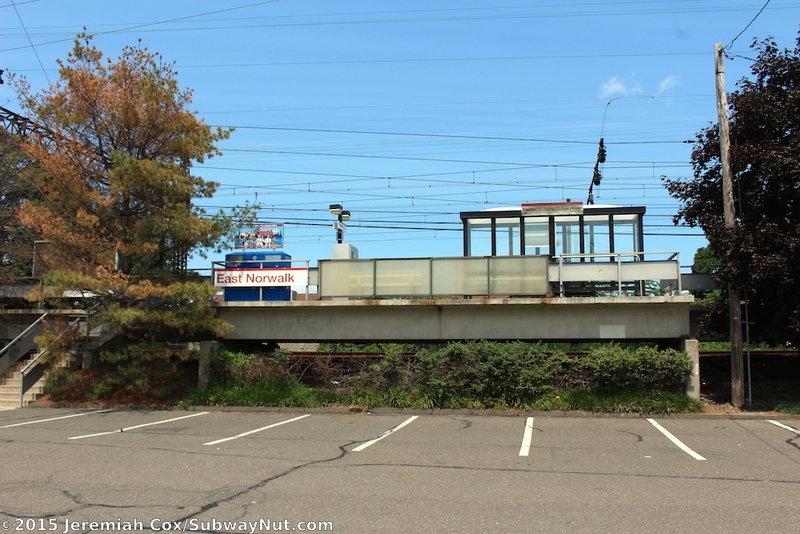 On the side of the station house is an NH New Haven replica sign and a few more signs with the letters ENRR (for the station) in a similar format that explain the expensive parking rules "Permit Parking 24/7/365 Days, Weekends Only Daily Rate $8." 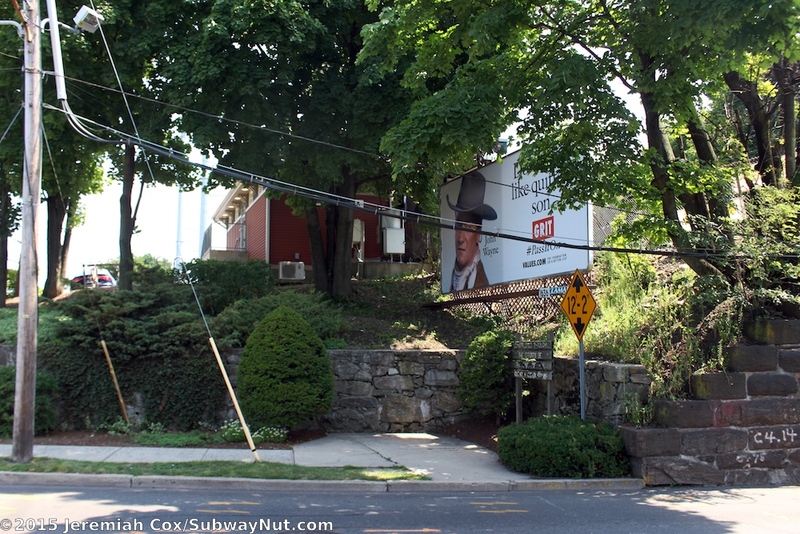 All access to this platform is from a small steep driveway with a narrow sidewalk on the south side down to East Avenue. 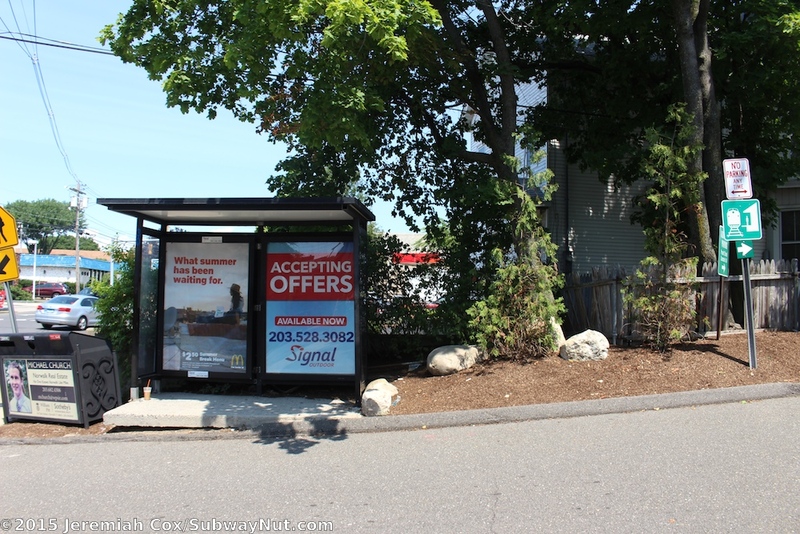 On the west side of the entrance is a randomly placed bus shelter for nothing (and no real sidewalk access). 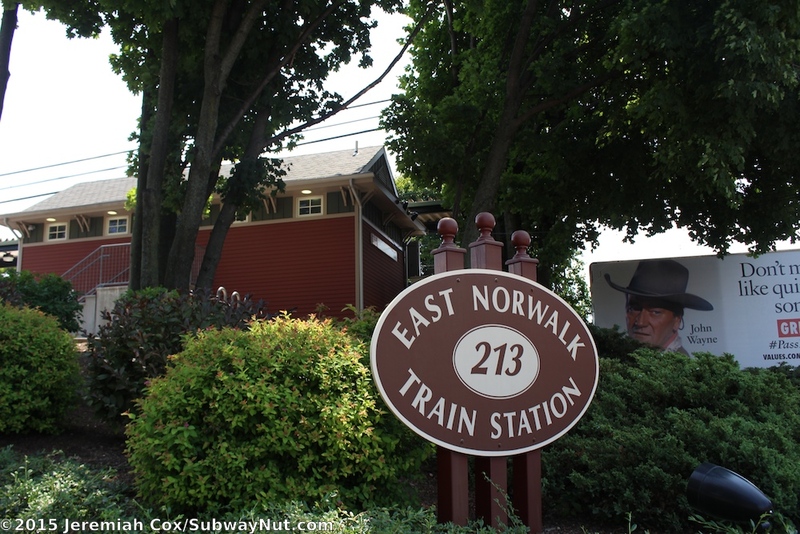 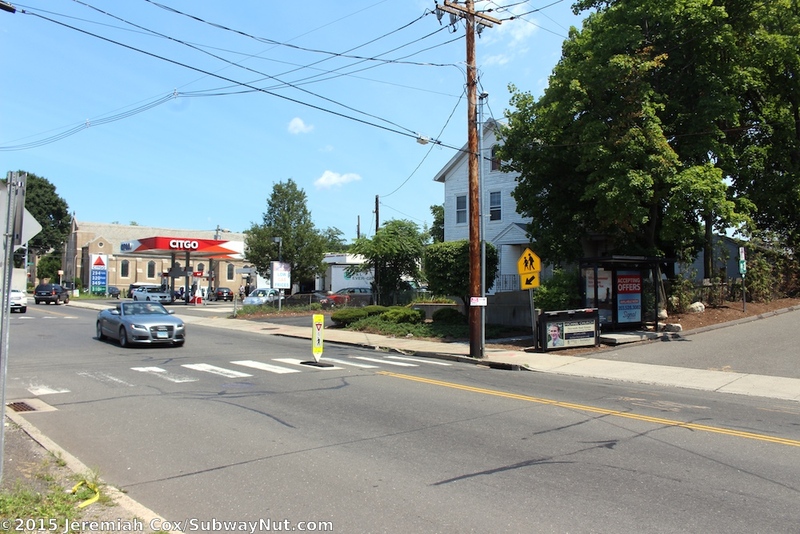 There is also a small maroon sign that says East Norwalk - 213 - Train Station. 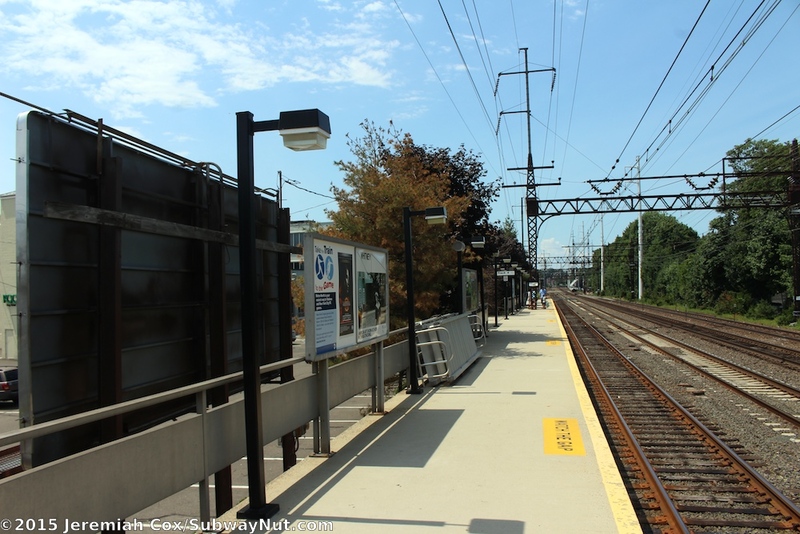 The New Haven-bound platform is extremely simple, 4 cars long, silver railings and benches, along with a single bus shelter for waiting passengers in the middle of the platform. 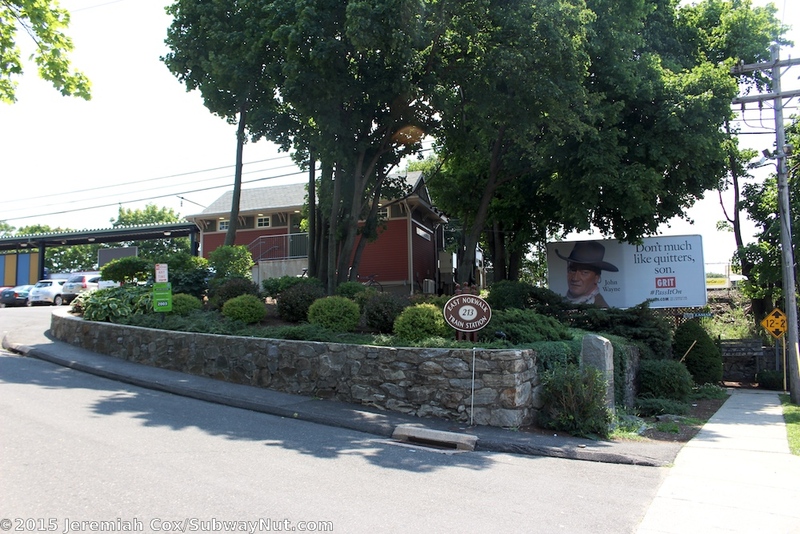 It is along a parking lot not for rail passengers but surrounding businesses including the Pooch Dog Hotel-Daycare-Spa. 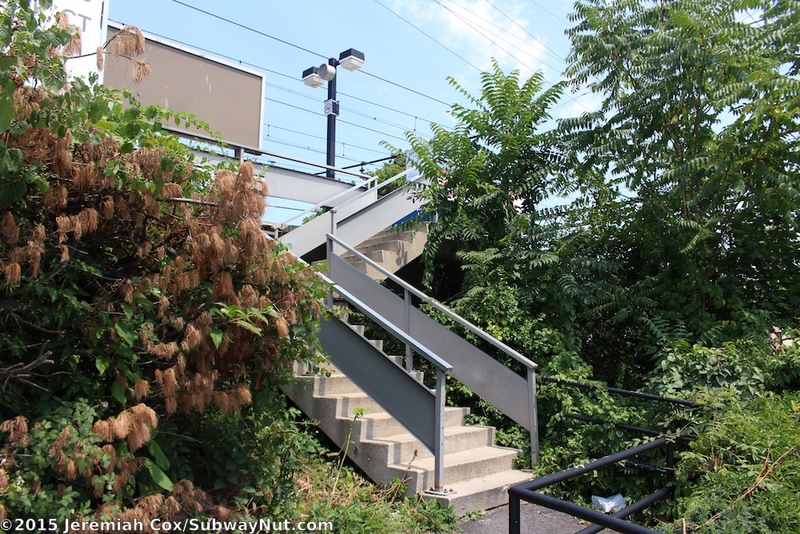 A number few staircases lead down to this parking lot plus an ADA ramp at the extreme western end of the platform. 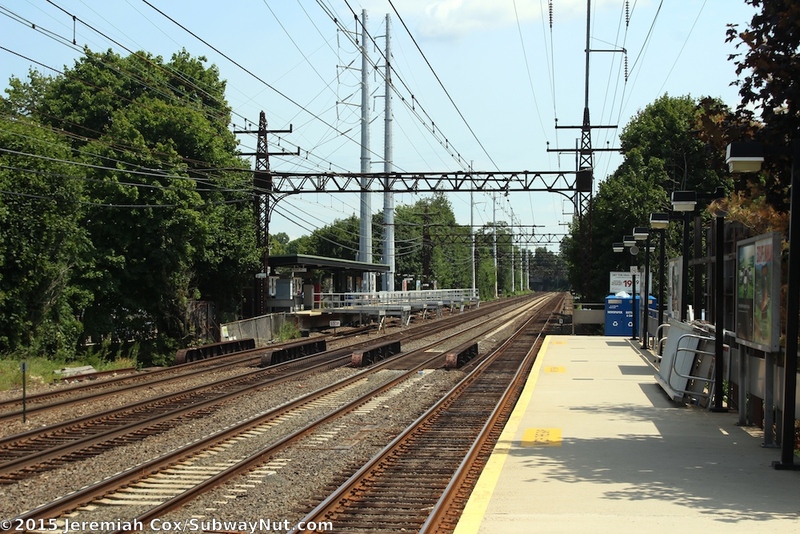 A portion of the various parking lots that stream together west of this platform is for commuters.